The studio at BAM is something out of the ordinary. 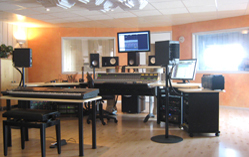 When most studios, at least in Sweden, move towards small production booths, BAM include a 100sq m live room with complete audio-video link to the studio control room. This can be used in a number of interesting ways. • as a film/video or photo session studio. There's even room for a club size audience! The studio on the second floor is built around a large, airy control room with daylight and non-fatiguing acoustic characteristics. 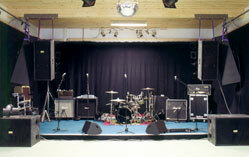 There are two 8 sqm iso-booths and a machine room which can double as a third iso-booth for a guitar amp or such. The recording is made exclusively through on-board SSL Super Analogue pre-amps and a number of outboard pre-amps. Technically the studio offers the best of both worlds with a 72 input 24-bit hard disk recording system with hi-end converters and a 2' analog 24-track tape machine. 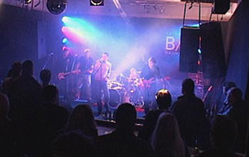 Monitor speakers include 4 separate stereo systems and a full range 5.1 set-up with bass managment. BAM is a great place to mix with the ultimate combination of hi-end analogue equipment paired with the best of todays digital processing and control. The SSL AWS900+SE console doubles as a 24 channel hi-end analogue console and as a control surface for either Nuendo 5 or Pro Tools 9. The console is fitted with total recall, classic SSL automation and the latest version 4 software including the A-FADA utility which lets the DAW control also the analogue faders and cuts of the AWS900. The SSL Logictivity browser ensures total control over mix passes, total recall and project specific information from the DAW. A number of classic outboard hardware signal processors in combination with the Universal Audio UAD-line, Melodyne, Drumagog and other plug-ins, makes just about any mixing task possible. The TV screen can be used for mixing to picture, to watch the session downstairs, as a second computer monitor, and for showing reference DVD's with audio through the 5.1 system. Alfonzetti perfoming live downstairs at Bauman in front of a live audience, while being recorded on the 2' recorder in the studio upstairs. One of many interesting ways of how to use the BAM facility in a creative way. Click picture to hear the result released on the "Machine"-album.